Up for sale we have a 1958 Chevrolet Impala. This is one of the most iconic Classic Cars to ever hit the road. The one we have for you has all the classic eye appeal but has had some great upgrades done as well. This is a TN car that has a rock-solid body with great body lines, gaps, and fit. 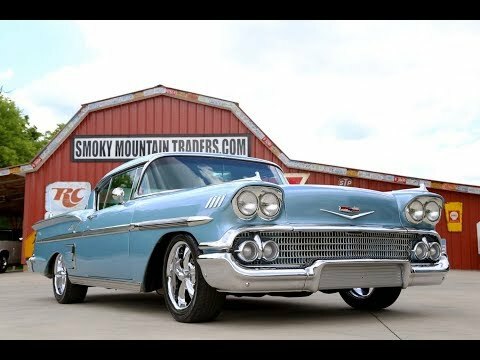 The '58 is a one year only body style that is the epidemy of what we leave about classic Chevys. With gorgeous body lines, a style that changed cars forever, and all the chrome and stainless your heart could desire this is one stunning ride. It's covered in the base coat clear coat Silver Blue paint that has been buffed and polished to a gorgeous shine. All the chrome and stainless is also beautiful and provides all the complement you need for the Blue paint scheme. You'll notice all the glass is in great condition as well, and that the side windows operate as they should. To finish off the exterior it features a set of Ridler Wheels. On the inside it's done in the two tone Blue color scheme with the bench seats both front and rear. The seat covers are done in Slate Blue and were redone at the time of the restoration. Also, you'll notice the door panels are done in the matching color with the headliner and carpet also being done in a darker blue. Looking at the dash you will notice the metal is done in the same Silver Blue color scheme as the exterior which really pulls the entire look together beautifully. As you can see it has the factory gauges, but the radio has been upgraded to a digital unit and it also has Vintage AC. In the trunk it's got matching door panels and carpet. Under the hood it features a 350 engine that's mated to the 700R trans and the stock style rear end. The 350 is set up with an Edelbrock intake and Carb. For exhaust it has Headers with dual pipes and new mufflers. To go along with the Vintage AC it also comes with Power Steering and Power Brakes with Drilled and Slotted Disc on the front. Keeping this '58 cool should be no problem as it's upgraded with the Aluminum Radiator. When you look under this '58 you will see that all of the frame and floors appears to be solid and in great condition.